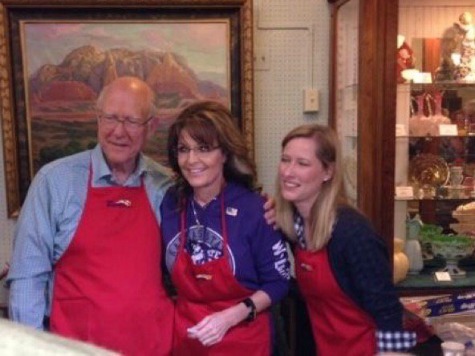 On Thursday, former Alaska Governor Sarah Palin reminded voters in Kansas that Republican Sen. Pat Roberts has stood against amnesty for illegal immigrants throughout his career and fought with Sens. Ted Cruz (R-TX) and Mike Lee (R-UT) to defund Obamacare. Roberts, who may have survived his GOP primary against Milton Wolf because there was absolutely no daylight between him and his opponent on amnesty for illegal immigrants, is in a dog fight with Greg Orman, an “independent” candidate whose on amnesty and abortion align more with Democrats, after the Democrat was able to get his name off of the ballot. Palin asked voters not to be fooled by Orman in a race Republicans must win to retain control of the Senate. Palin, who has the most influence and some of the highest favorability ratings among conservative and Tea Party voters, campaigned to help Roberts shore up his right flank, calling for unity to help Republicans take back the Senate and get rid of Sen. Harry Reid (D-NV) as Majority Leader. As the Kansas City Star noted, Orman, a financier, “supports a path to citizenship” for the country’s illegal immigrants. “If you are here undocumented, you should register, pay a fine, obey our laws, hold down a job and pay taxes, and then I think you should be able to stay here,” Orman said at a Kansas State Fair debate earlier this month, according to the Star. Roberts, on the other hand, voted against Ronald Reagan’s infamous Immigration Reform and Control Act (IRCA) of 1986 when Roberts was a House Member. Roberts also voted against comprehensive immigration reform in 2007 that President George W. Bush tried to pass along with the late Sen. Ted Kennedy (D-MA). And he also voted against the Senate’s “Gang of Eight” comprehensive amnesty bill last year that the Congressional Budget Office determined would lower the wages of American workers. Palin, who has always urged Republicans to stand up for the “forgotten man,” has been one of the foremost opponents of illegal immigration. She even called for Obama’s impeachment due to his lawlessness on illegal immigration, which Palin said detrimentally impacts Americans — native-born and legal immigrants — of all backgrounds. Palin has blasted the “wealthy bipartisan elite, who want cheap foreign labor and can afford for themselves the best “border security” money can buy in their own exclusive communities,” for not caring about the concerns of American workers when it comes to illegal immigration. “He’s Palin told a cheering crowd. a lot of the country’s eyes are on you …making sure that you make the right decision. “You won’t stay and kick the field goal, will ya?” Roberts jokingly asked, according to NBC News.